ZESI Provided design support services in preparation of the preliminary engineering report for the water line along T.C. Jester as part of the groundwater transfer and surface water transmission program. The study analyzed alternative routes. One route followed the most direct alignment utilizing locations within or adjacent to existing Harris County ROW. The other route avoided the use of Harris County ROW and easements following existing ROW and easements owned by others. North Harris County Regional Water Authority Project 11, Harris County, TX ZESI provided design support services in preparation of the preliminary engineering report. The study analyzed alternative routes. The total route is approximately 3.2 miles and line sizes range from 20- to 24-inches in diameter. The Edgebrook Reconstruction Project involved reconstruction of 1.5 miles of a fourlane boulevard roadway section. Utility adjustments included replacement of 8-inch and 10-inch gravity sanitary sewers, a 12-inch water main, and a 24-inch force main. 24-inch and 36-inch storm drains had to be abandoned and 6-foot by 5-foot and 4-foot by 5-foot RCB’s were installed as part of the project to replace them. The project included a categorical exclusions report, an impact study, a hydrology study, and Phase I and Phase II environmental site assessments. This project involved pipeline coordination and public meetings during the PER and through final design. It also included the R.O.W. acquisition for corner clips at 20 locations. This project was a joint funded project. The PS&E was based on the latest TxDOT format and criteria. This project involved a capacity determination for the High Service Pump Station 3 (HSPS 3). ZESI reviewed HSPS 3 flow data over a two-year period in order to develop appropriate peaking factors from the recent historical data. An hydraulic evaluation was prepared between Transfer Pump Station 3 (TPS 3) and HSPS 3. Included in the analysis were both existing and future proposed storage tanks. 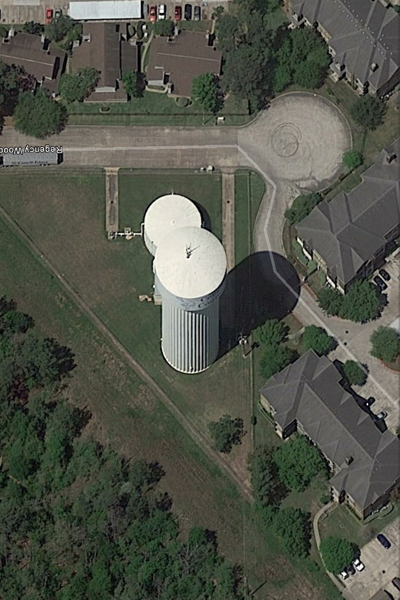 From as-built plans, the existing pipe and ground storage tank configuration was determined. From this data, an EPANET hydraulic water distribution model was developed in order to determine flow patterns to the tanks based on the existing configuration, future demands and peaking factors. An extended period simulation was run with this model to determine the impacts of future demands and the effects on the system of an additional ground storage tank. ZESI provided utility design for this project. This project involved the design of an 8-inch water line along Hooper Road from approximately 1,400 feet south of Spectrum Boulevard to Spectrum Boulevard and a 12-inch water line along Spectrum Boulevard from Hooper Road to Kirby Drive.